Look. Very seldom do NBA on-court altercations escalate into anything that could credibly be described as an actual fight. The reason for this is simple: NBA players are competitive enough for frustrations to boil over into personal conflict, but are also grown-ups, and smart enough to know that the consequences aren’t worth actually throwing down on the court. Still, Lonzo’s excuse, here, is pretty lame: he is in absolutely no danger of getting a tech if he just puts his body between his teammate and Suns players, in the traditional peacekeeper role. 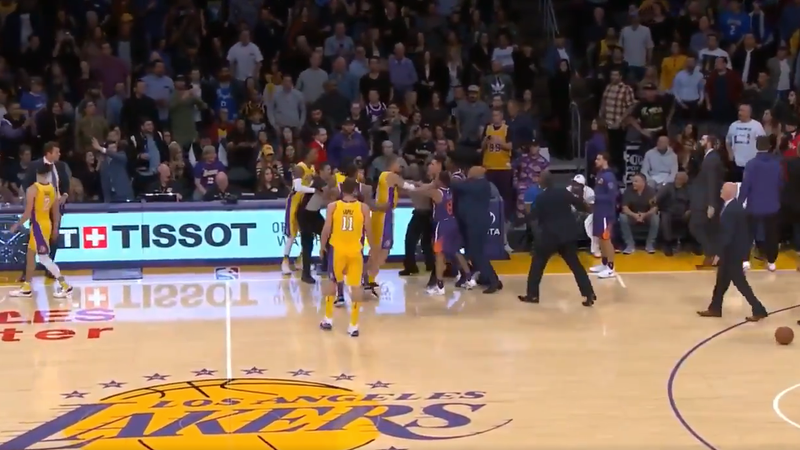 Even teammate Brandon Ingram, who described the altercation as “false action,” got in there and used his long arms to create a little space between the hotheads. That’s what you do! Because, in the rare instance where a player does throw a punch, you don’t want to be the rookie who walked 12 feet away from the action when you could’ve been there to break it up. What Lonzo didn’t do to aid his teammate in this tussle he more than made up for with his electric play, blazing his way to six whole points on 3-for-7 shooting in 38 minutes.